After the unveiling ceremony, ex-miner Steve Wyatt, Chairman of The Dodworth Miners’ Memorial Fund, commented to me that Fiona Spiers, the Head of the Heritage Lottery Fund, Yorkshire and the Humber, had been impressed ‘by just how many local people had come along to support the unveiling of the memorial’. 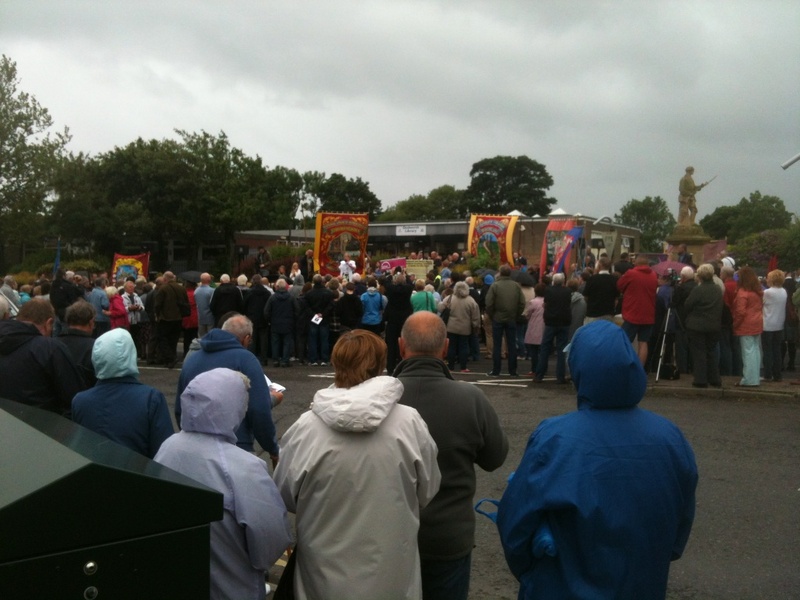 Banners of the National Union of Mineworkers branches were carried in a procession at the event and Dodworth Colliery Band performed. One local participant wrote about the unveiling ceremony in a letter to the Barnsley Chronicle, ‘Marching from the church, walking beside our old NUM officials, brought back memories of the 1984/85 strike, with the brass band playing and children skipping; it brought the community back together’. The event is relevant to the research I am undertaking as part of the Understanding Everyday Participation project. My research aims to contribute a historical dimension to our understandings of the contemporary cultural ecologies and patterns of cultural participation in post-industrial towns. My project is exploring how far industry, in addition to other factors such as location and social class, has impacted upon cultural participation in industrial urban areas such as Barnsley, Batley and Dewsbury in South and West Yorkshire. The study is examining cultural participation amongst communities in these areas historically and contemporaneously in order to deepen our understandings of the disconnections and connections between traditional public cultural institutions and local cultures of participation in these areas. My research will explore, for example, episodes of cultural participation and activity organised by institutions such as miners’, and other, unions and organisations amongst communities in these areas. The Active People survey suggests that Barnsley has particularly low levels of cultural participation. Perhaps, however, the enthusiastic participation of local community members in the unveiling of the Dodworth Miners’ Memorial could be seen to provide a noteworthy example of local people within this area coming together to participate culturally in an activity which they value and which they feel matters to them.